Strange days, indeed. Will Fedex, UPS and USPS delivery trucks soon be replaced by whirring swarms of package laden octocopters? Perhaps not, yet Amazon’s Jeff Bezo’s has grabbed global attention by demonstrating how autonomous delivery drones might someday, perhaps soon, take to the skies. 60 Minute’s Charlie Rose fronted a bit of fluff on Amazon and, well, all of the amazing things the company has done, is doing and, here comes the punchline, will do in the not-too-distant future. Specifically, Amazon CEO Jeff Bezos lead Rose into a conference room where a number of octocopters were on display. Charlie Rose: Oh, man… Oh, my God! Jeff Bezos: …is…these are octocopters. 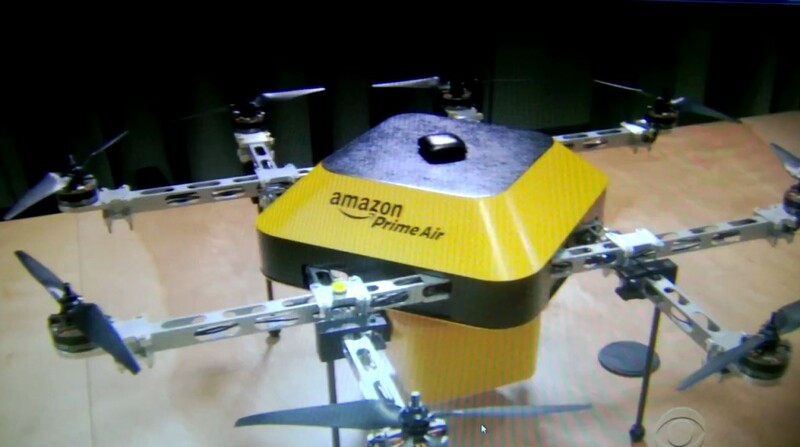 Yes, as Bezos said, Amazon’s delivery drones are years away from showing up at your front door. Although the technical hurdles are significant, perhaps the biggest obstacle is the Federal Aviation Administration (FAA), which has final say on all things airborne. And, at the very least, the FAA won’t deliver rules on commercial drones until 2015, though experts say that could be a highly optimistic timeframe as public apprehension about the privacy busting devices continues to grow. Moreover, at least in the here and now, the concept is only applicable to deliveries of 5lbs (or less) packages to addresses within 10 miles or so of an Amazon fulfillment center.